The black-footed ferret is the only ferret native to North America. Watch our video on species hurt by KXL. This 2-foot-long, black-masked member of the weasel family once occurred in central grasslands and basins from southern Canada to Texas but is now one of the most endangered mammals in North America. In the early 1900s, the United States was likely home to more than 5 million ferrets. But ferrets, which hunt prairie dogs for food and live in their burrows, were almost wiped out early in the 20th century after agricultural development and rodent poisons devastated prairie dog populations. 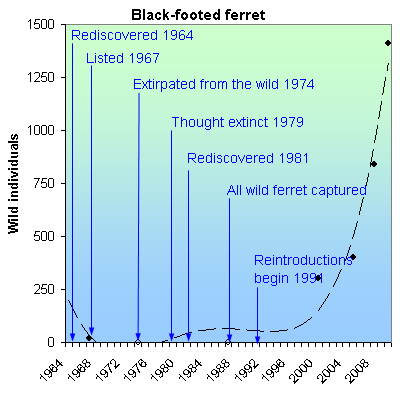 Thirteen years after they were listed as endangered in 1967, the last captive ferret died, and the animals were thought to be extinct in North America. Then in 1981 a small relic population was discovered in a Wyoming prairie dog colony. Between 1991 and 1999, about 1,200 ferrets from that population were released in Wyoming, Montana, South Dakota, Arizona and along the Utah/Colorado border. At least two of those reintroduced populations are established and no longer require releases of captive-raised ferrets. Biologists estimate there are now a total of about 1,410 black-footed ferrets living in the wild. 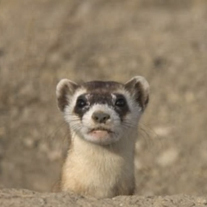 Unfortunately the black-footed ferret is also one of a dozen species in the path of the proposed Keystone XL pipeline. Learn more now.